I have spent the last two weeks doing a combination of “spring cleaning” and working through a stack of commissions. I have needed to do the cleaning for a while. It has been a hectic summer. I can now see the light at the end of the tunnel with the commissions. I have all of them out of the kiln and most are now done. All that remains is a stone or two to set. Then it is on to preparing for the holidays. Angie Stiles-Richardson and I spoke about me joining the CIAO folks at the first friday in November and I am jazzed. The cornerstone building is a lovely location and last month when I visited there they had a fellow playing acoustic guitar. It is like a wine and cheese party that happens to have art vendors! Here are two pieces out of many that I have finished recently. I am busy as a bee getting ready for the Washington Fine Arts Fair this weekend. Above is a smaller diameter viking knit bracelet I have been developing. 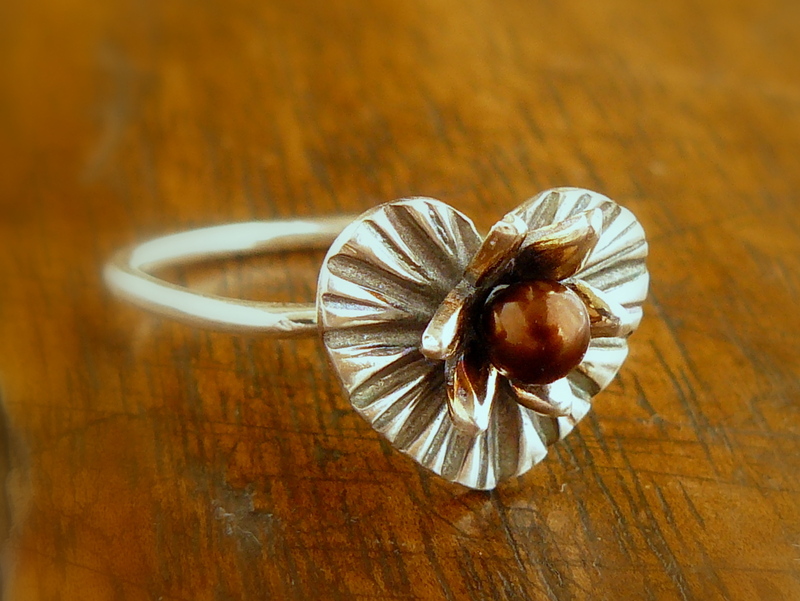 I make quite a number of these in copper due to the very low cost of the copper wire and then when I am certain how many feet of what gauge wire I want to use I make them in silver. 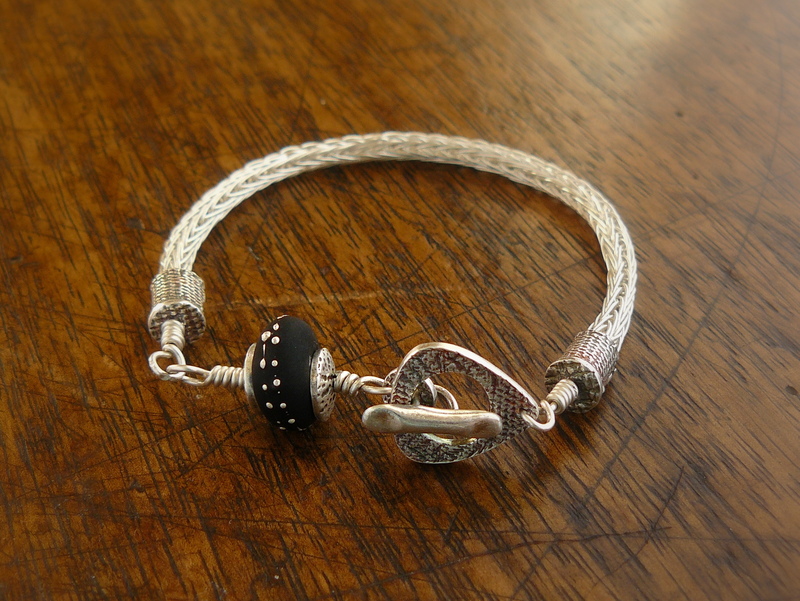 This bracelet has metal clay based caps and toggle clasp. The hand lampworked glass bead is by Ellen Dooley and includes fine silver dots strung on the surface. 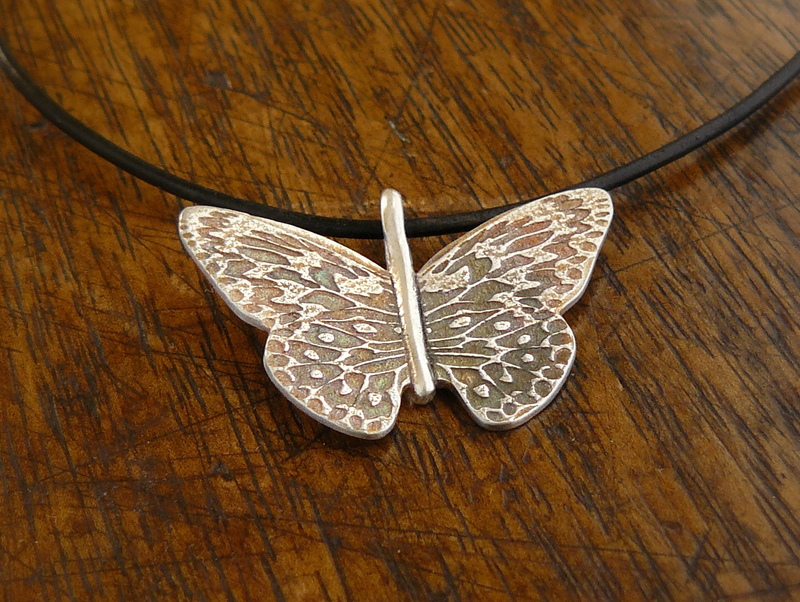 Below is a butterfly pendant I made a couple of weeks ago or so and had not had time to photograph until now. It came out with a lovely patina very reminiscent of a monarch butterfly and I am so pleased. A few people have seen it and the response has been very positive. Butterflies really capture people’s imagination. I hope to get time to work on more butterfly related projects. Still on my bench today are a floral and leaf pendant and an Egyptian hieroglyphics pendant entitled Cracked Tablet. There is a decent chance that both of those could be with me at Washington. I hope to see many of you there! This weekend I will be at Luthy Botanical Garden from 10am to 5pm Saturday and from 12pm to 5pm on Sunday. Please come out and see all the lovely art on display there. 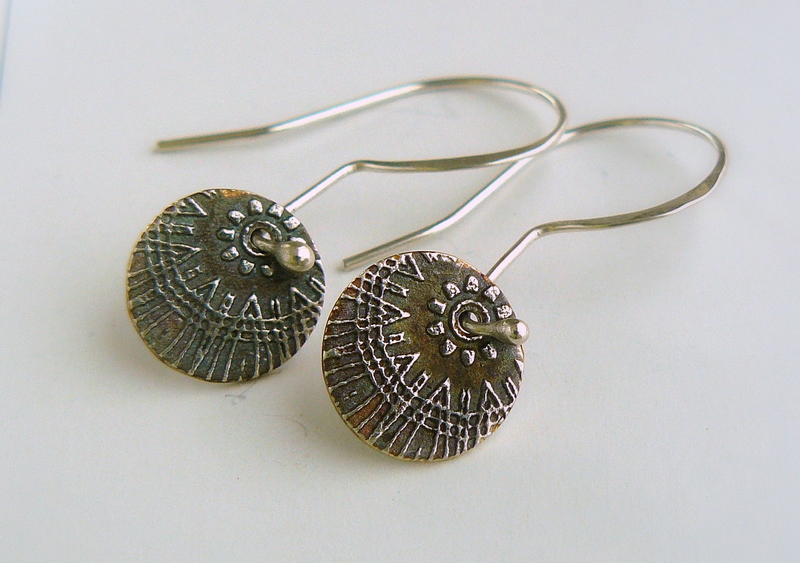 The earrings above have the most beautiful patina. 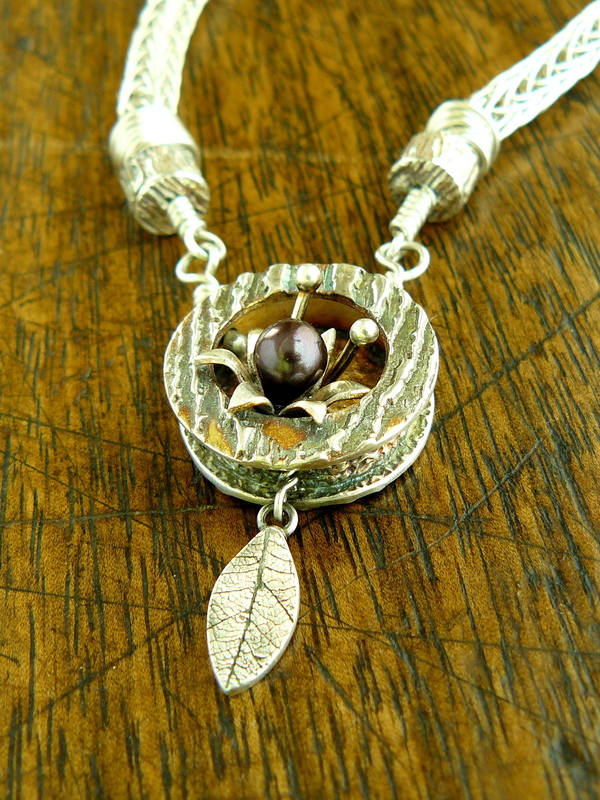 I have put together a lovely box bead with a flower blooming out from the window in the top of the box. The necklace contains two sections of argentium sterling silver viking knit with fine silver end caps and toggle clasp. The clasp matches the box very well and the whole piece has a pleasing weight and feel when worn. This piece comes together just in time for the Rhapsody in Bloom Art Fair at Luthy Botanical Gardens this weekend. Please consider coming out if you are in the Peoria area. The gardens are such a luscious location for an art fair. Tower Park was lovely. The weatherman called for cool and breezy with rain. but we got lovely warm sunshine. It was perfect weather for the fair and also for the race for the cure. I so enjoyed meeting new people and seeing friendly faces from last year as well. It certainly is gratifying to see people wearing my work. 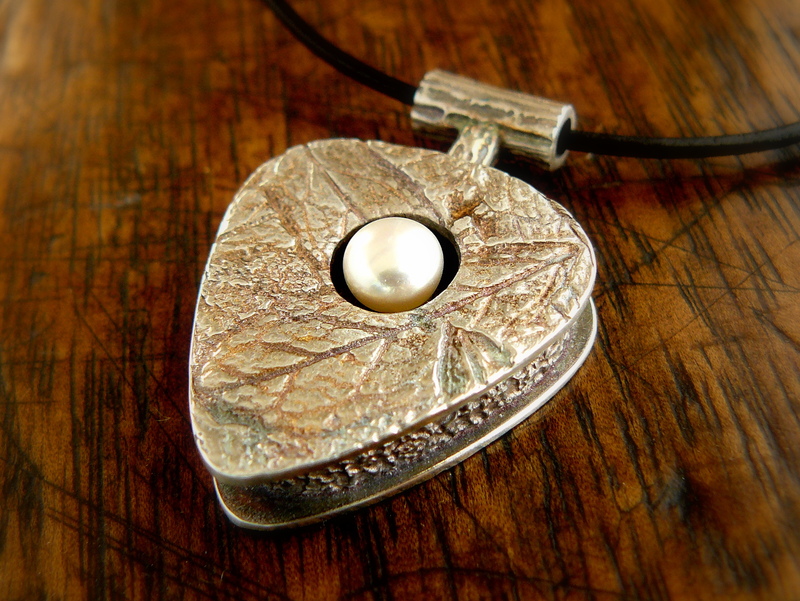 I did indeed finish this lovely Leaf and Twig Box with Pearl pendant and am very pleased with it. The UPS delivery person just left a package on the doorstep with metal clay. I was pretty much out of metal clay so I am ever so happy to see the package! 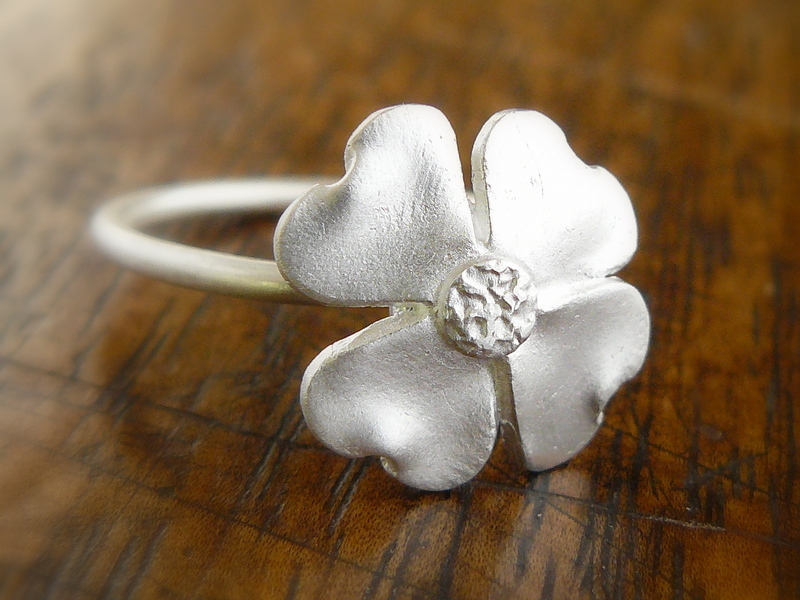 I dearly loved the Lily Pad Ring that I made previously and have decided to embark on a short series of flower and pearl rings as a result. This ring is the second in that series. The third ring will be going into the kiln later today. 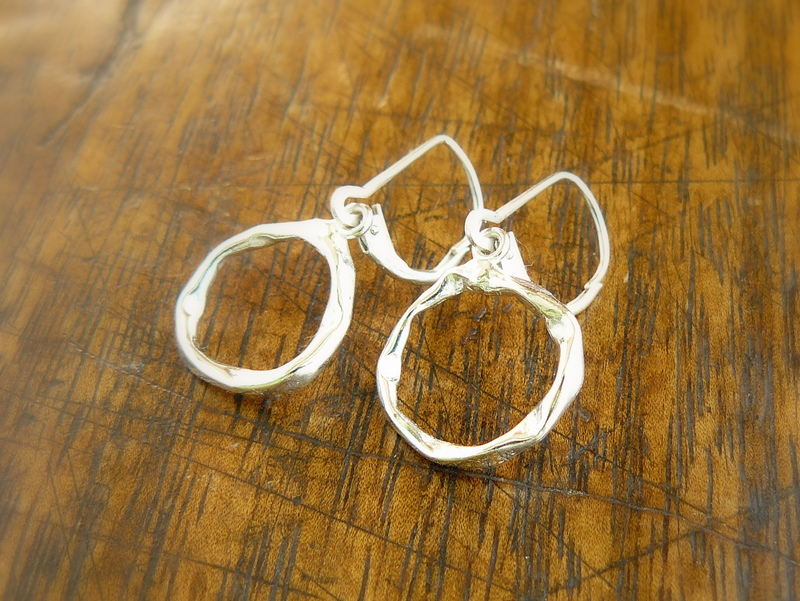 This ring and the next ring are the result of a design that did not quite work. The flower I originally made was a bit too large when placed on the heart element. The blossom dominated and obscured the heart too much. That blossom is now placed on a very small disk with a cup shape supporting it and acting as an embed point for the fine silver wire shank. This ring is my twelfth ring for the flickr ring a week challenge. The group had proposed a challenge to create a ring that is “kinetic” by March 27th and this is my kinetic ring. The bead and the star shaped piece below it both spin. 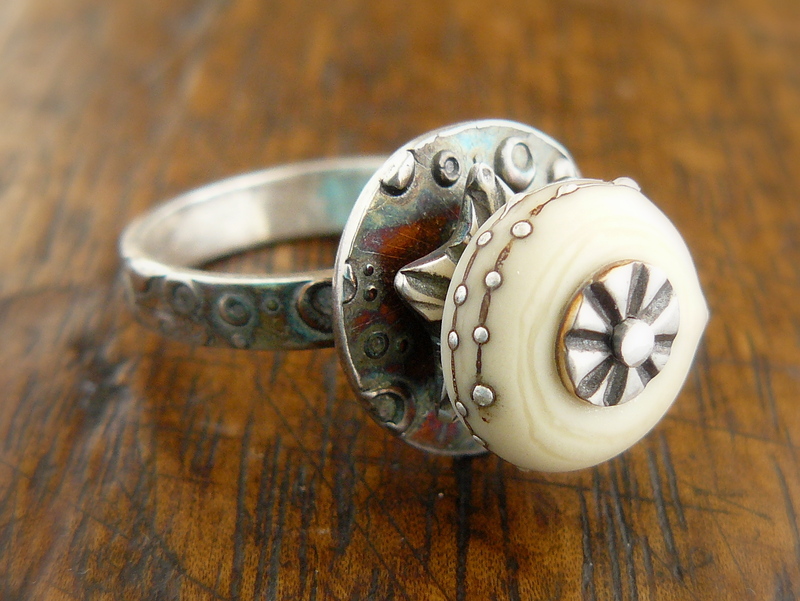 This ring is entitled Moon Lander Ring and has a crater texture with hand inscribed scratches. The “moon lander” consists of the three elements, the star with radiating grooves, the bead with tiny silver dots following a line and the radial line circle at the top, all riveted onto the moon crater layer. This ring has wild colored patina and I used a very light hand removing the color from the high spots because it was so beautiful. The bead is once again by Ellen Dooley. I am putting together pieces to take to the Spring Bloom festival tomorrow and this particular piece stood out as having such incredible patina that I had to run up here and post it. 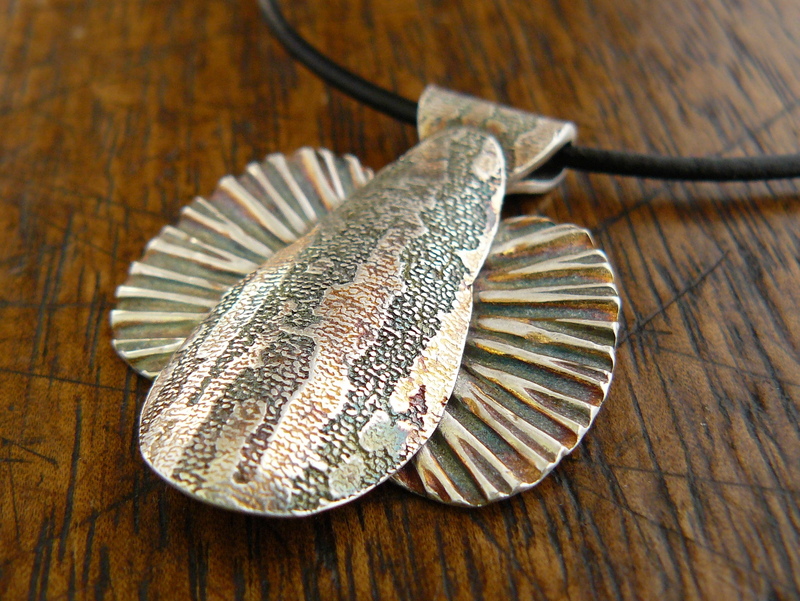 The pendant is entitled Oceana and is inspired by all the ocean documentaries I have been watching with my son lately. The original idea came from a depiction of a prehistoric sea creature but yesterday I noticed that it bears a slight resemblance to cuttlefish. The multicolor patina this piece took on is very reminiscent of the way cuttlefish communicate with one another. This is not the only piece that I finished today with this showstopper patina. You have to see this stuff to believe! Those of you who have visited my booth at shows know that I often make dogwood flower items. There is a personal connection with my mother. It was her favorite flower. There is a personal connection with my childhood. We used to live in New Jersey when I was quite young and there were several dogwoods in our back yard. They were lovely when they bloomed. When I was in college, the campus had two ancient dogwoods. One of the trees was a pink, the other a white and they were growing up together entwined. My Mother-in-law takes these photos of flowers, she arranges them facing the bed of her scanner, so they are upside down to her, and then she scans them. One of her best photos, in my opinion, is of a group of dogwood flowers. Maybe I like that one best because of all those other connections with dogwoods but it is one of her best sellers at art fairs. Metal clay lends itself so well to hand sculpted pieces like this. Each petal is cut from damp clay, slightly reshaped and hand attached to the base. The flower is completed by adding an element to simulate the center. You can just make out my fingerprints as waves in some places. It turned out to be a challenge for me as a sort of amateur jewelry photographer to get a nice shot of this due to the brushed finish which scatters light all over. I am happy with this shot although I do believe this is a case in which the real article is more beautiful than the photograph. This ring is my tenth for the flickr ring a week challenge. You can find the whole group here, and my photostream here. Ring number 9 for the Flickr group challenge “Ring a Week” is entitled Floating Blossom ring. 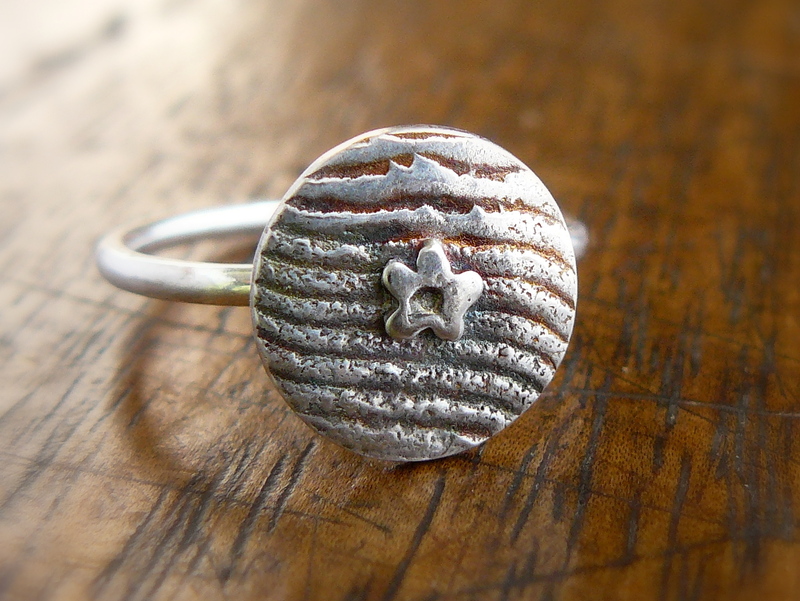 The ring is all fine silver and has a lovely multicolor patina on the face. I find myself slipping behind a bit on the rings right now due to a maelstrom of personal life issues. Everything is fine right now though so I will work on catching up next. The first art fair of my season is this Saturday, the Spring Bloom fair at the Bloomington Sale Barn. It will be really nice to be inside what with the chilly temperatures of this week. I have so many things sitting on my bench that should go into the kiln tomorrow or maybe tonight if things go well. It is very exciting to get back in the swing of doing art fairs again. I need to spend some time updating my upcoming shows page because I have gotten some further confirmations for more shows. In brief, I was accepted for the Elmhurst Fine Art Fair show (this is a Chicago area show) and also the Elmwood Strawberry Festival show (this is a small town about a half hour from Peoria, they were decimated by a tornado last year and are very excited to show off how well the rebuilding effort has gone). But first things first, I need to get back into my studio and put finishing touches on a kiln full of items!